T1 Bis The Madres of 32 m2 for 2 people Residence Saint Vincent 2nd floor. Panoramic view of the Madres and its surrounding mountains and the old village of Vernet les Bains. 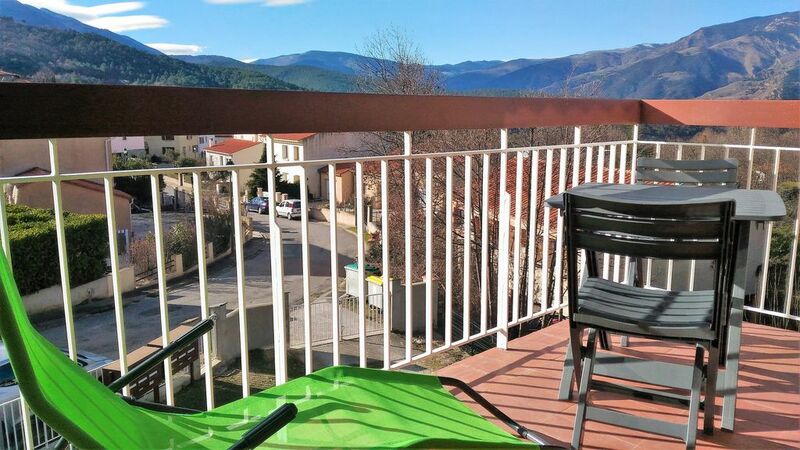 Do not hesitate to contact me, I will redirect you to my website at the foot of the Canigou Vernet Les Bains which will give you all the necessary information on my different offers furnished tourist studios, T1 and T2 in Vernet les Bains. You can find my phone number by typing AU PIED DU CANIGOU on the BonCoin (Search in title only) or on Google Maps. Located at the top of the old village facing the fortified castle and the church in a quiet residential area not overlooked 5 minutes walk from the village center with shops and 10 minutes from the spa (or 2 minutes in car). This T1 Bis is located in the secure residence Saint Vincent located on the 2nd floor of 3 with equipment and quality furniture. The residence Saint Vincent is a small residence with 3 floors and 10 lots. Tranquility assured. Private parking in the enclosure of the fully enclosed condominium. - Bathroom equipped with bathtub, washbasin, electric blower, private washing machine, hair dryer, drying rack, vacuum cleaner, iron and ironing board with non separate toilet. You will be delighted to eat outside on the terrace with garden furniture and manual awning covering the large terrace. Books, magazines and tourist documentation at your disposal for free consultation. If you do not want to rent bed linen (sheets, pillowcases, bolster cover, duvet cover) and / or towels (towels, gloves, bath mats), please bring your own linen of bed and toilets. If you do not want to rent bed linen (sheets, pillowcases, bolster cover, duvet cover) and / or towels (towels, gloves, bath mats), please bring your own linen and bed! Charges included: Heating, electricity and water all inclusive.